I added a few pictures, like the one below, to the end of my post about the Jaeil Jutaek redevelopment near my house, which can be found here. I'll likely be updating it monthly. Bucheon is the small city (of 800,000 people - maybe not so small) sandwiched between Seoul and Incheon on Seoul subway line one. 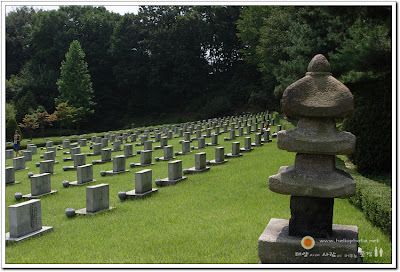 During the Joseon dynasty much of what is now Bucheon was a part of Bupyeong-gun (county). Below is a map made in 1872, though if you're expecting a topographical map, I wouldn't scrutinize it too closely. Still, the large mountain at left is Gyeyangsan, while the river at the top is the Han. 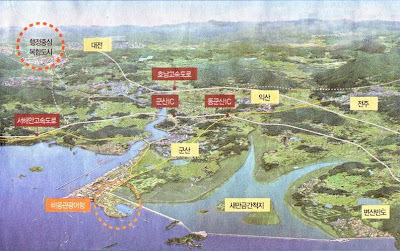 The stream running down through the middle is Gulpocheon, which empties into the Han near Gaehwasan, just west of Banghwa-dong. Despite this, the site I got it from is quite good. Just click on부평부지도 at left and a new window will open (works best in IE). On the right is a list of names in Hangeul with the Hanja next to them. Just click on a name and the program will zoom in to its spot on the map. You can look at any county in the country from that time (though I had to turn the map above sideways to make it face north). 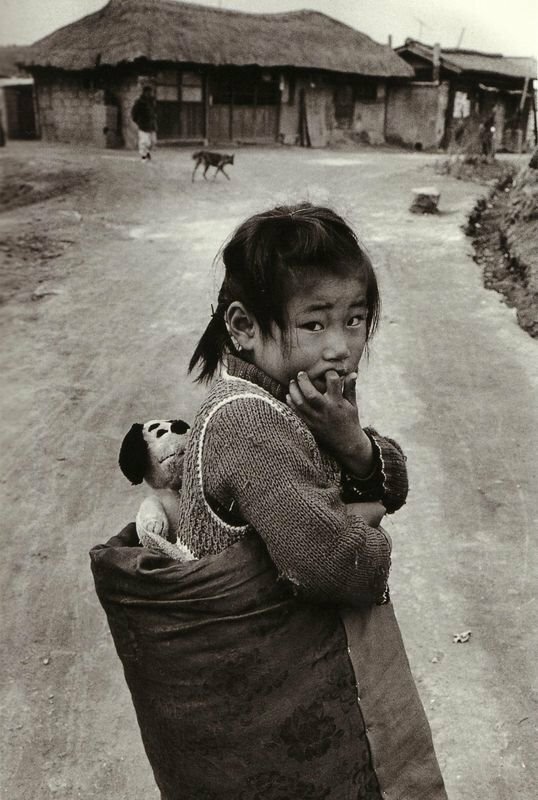 The aftermath of liberation led to, of course, the Korean war. 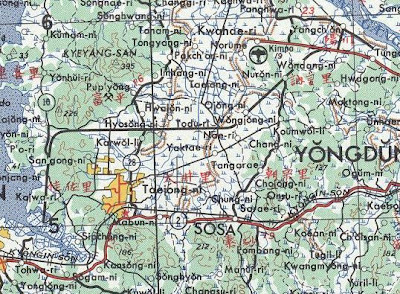 During the aftermath of the Incheon landing, Sosa, which lay on the Seoul-Incheon highway, would see fighting take place around it in September of 1950. The tanks destroyed on September 17, 3 miles east of Sosa. [T]he 1st Marines resumed the attack on the morning of the 18th and passed through and around the burning town of Sosa at midmorning. By noon the 3d Battalion had seized Hill 123, a mile east of the town and north of the highway. Enemy artillery fire there caused many casualties in the afternoon, but neither ground nor aerial observers could locate the enemy pieces firing from the southeast. 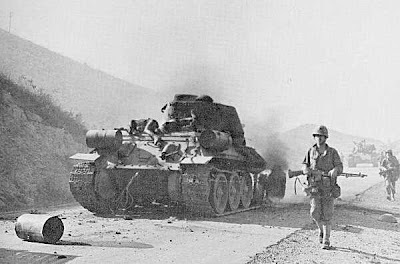 Beyond Sosa the North Koreans had heavily mined the highway and on 19 September the tank spearheads stopped after mines damaged two tanks. Despite the description of "the burning town of Sosa", it would seem that Sosa wasn't too badly damaged, judging by this picture I found taken on September 23, 1950. 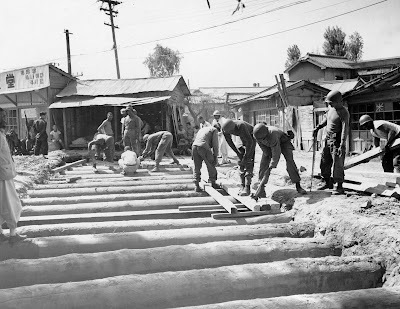 "Troops of the 73rd Combat Battalion bridge a small stream in Sosa, Korea. 23 Sep 1950"
During the war, the US military made maps of Korea, a number of which can be found online. Above you can see the Seoul-Incheon highway in red, and judging by the large letters, Sosa was relatively important. What's interesting is that you can see several village names which survive to day, like Chung-ni, Ojong-ni, Yakdae-ri, and Nae-ri, which today are 'dongs' in Bucheon. 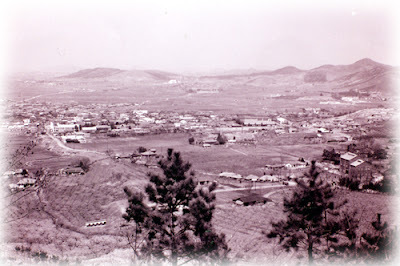 Here is a shot of Bucheon, then Sosa, in the 1960s, taken from Seongjusan, the mountain south of the station. As you can see, it's still little more than a large farming village. 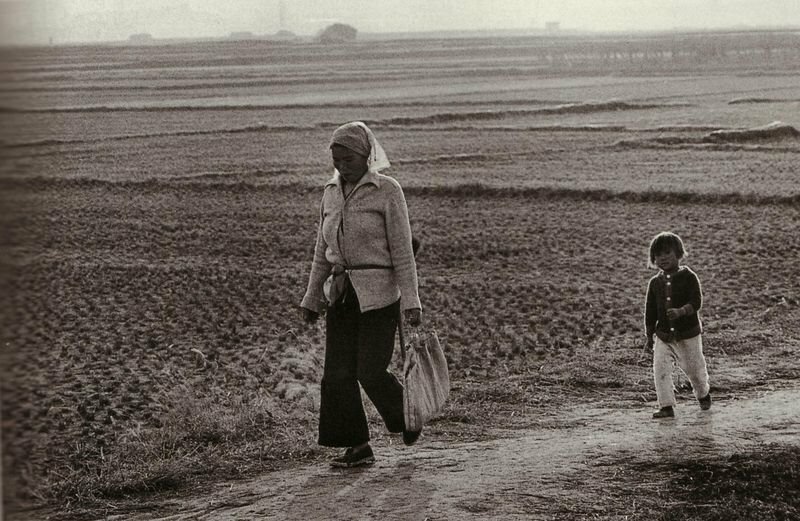 Below are four photos from Kim Ki-chan's book "Lost Landscapes", which I previously posted here. Here I found an undated photo of this man involved in a Dodang Gut. 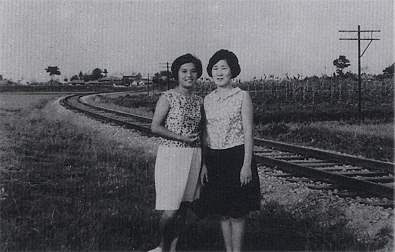 Here's a photo of two women standing by a train line in Samjeong-dong (in northwestern Bucheon). 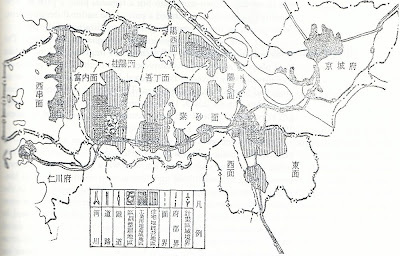 Above are photos of Jangmal-ri (top) and Ojeong-ri (Ojeong-ri can be seen on the map below). 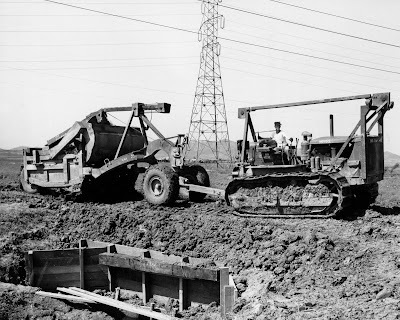 "Soldiers from the 453rd Engineer Construction Battalion operated a D08 bulldozer and carry-all, as he fills in drainage culvert on a railroad bed being constructed from Kimpo to Yongdung-po. 6 Jun 1951." 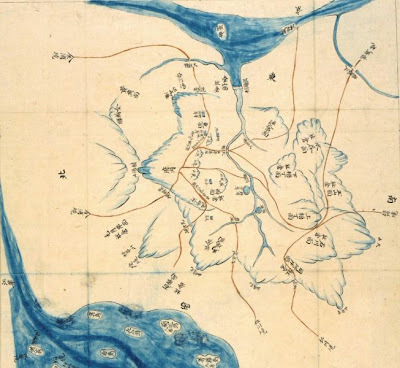 To become the crowded city it is today, Bucheon (then Sosa) began to expand east and west along the train line and north along the slopes of Wonmi-san (a friend told me that a taxi driver told him that 20 years ago there were still wild boars there). 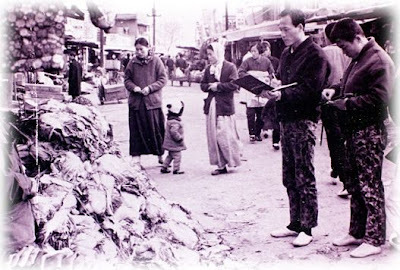 After losing bits of land to Seoul and Incheon in the early 1960s, Bucheon-gun was incorporated into a city in 1973. The picture below was taken north of Bucheon station on Jungangno, the street running north from the station. I have a hunch that the river below may now be under Neommal Gil, the street that runs from southeast (Sosa Station) to northwest (Jung-dong). 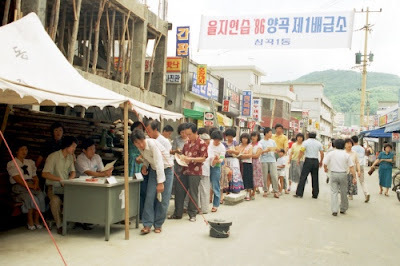 The banner reads "Let's build a future city through the citizen new village (saemaeul) movement". 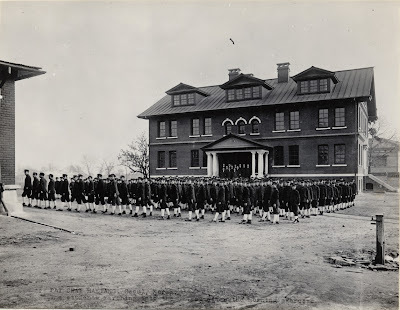 The workers are likely students, as they're wearing student defence corps uniforms. 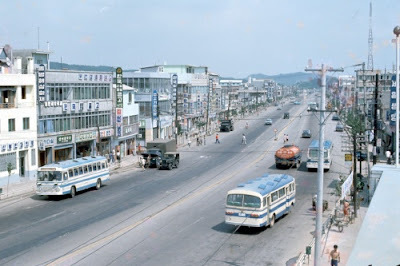 Below is what Bucheon looked like along the Gyeongin (Seoul to Incheon) Road, which runs south of Bucheon station, in the 1970s. 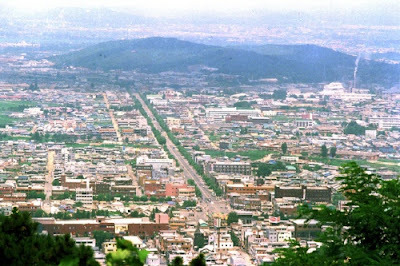 If we were to continue walking south up Seongjusan, we could turn face north and take in this view of Bucheon in 1981 (the dark smudge at top right is Gaehwasan, in Banghwa-dong). 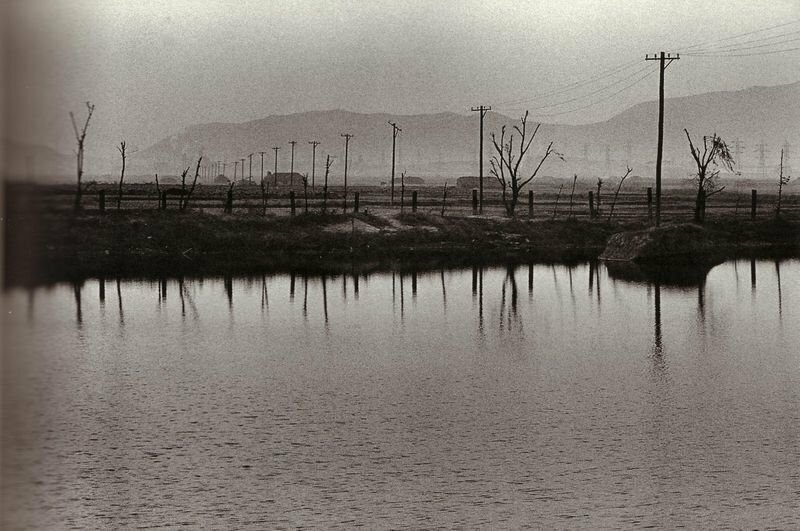 At that point, Bucheon had expanded less than a kilometer eastward from Bucheon station (at least near the train line), likely hemmed in by a river. 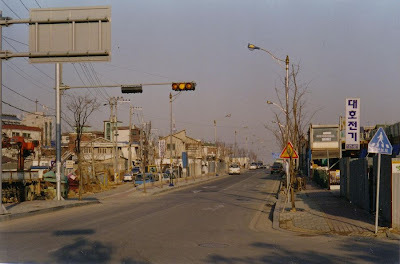 To the west near present day Songnae station, this photo was taken (in Sang 3 ri, now Sang-dong). The Gyeongin rail line is in the distance. These fields likely disappeared around 15 years ago. 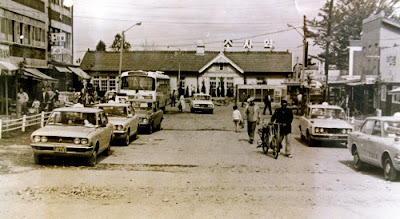 Behind that rail line is the Gyeong-in road, where this photo was taken in the 1970s. 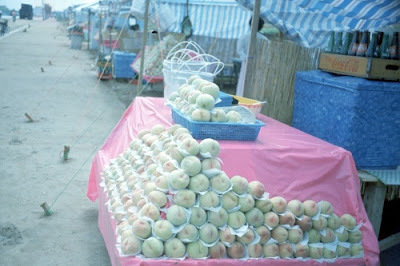 Bucheon was once famous for its peaches, and is still known (in its tourist material and in the name of a cultural center) as Boksagol (Peach Village). The peach trees are long since gone. The banner below is helpful, telling us it was shot in Simgok-dong in 1986 (the neighbourhood just north of the tracks near Bucheon station. 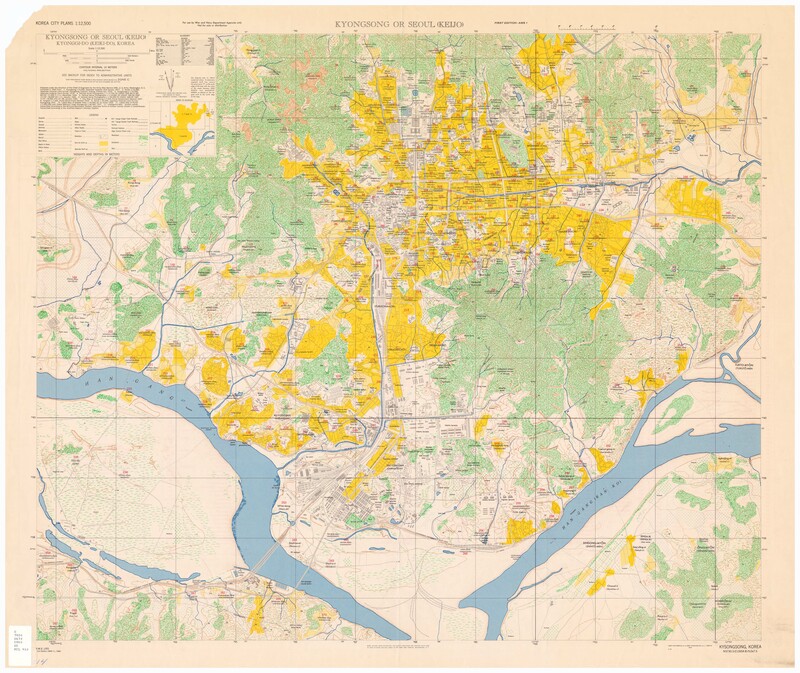 I imagine the reason Bucheon had not expanded westward was because an administrative decision had been made not to expand past a certain stream (if you look at this map of Bucheon, the Jung-dong development's curved eastern edge should be clear). 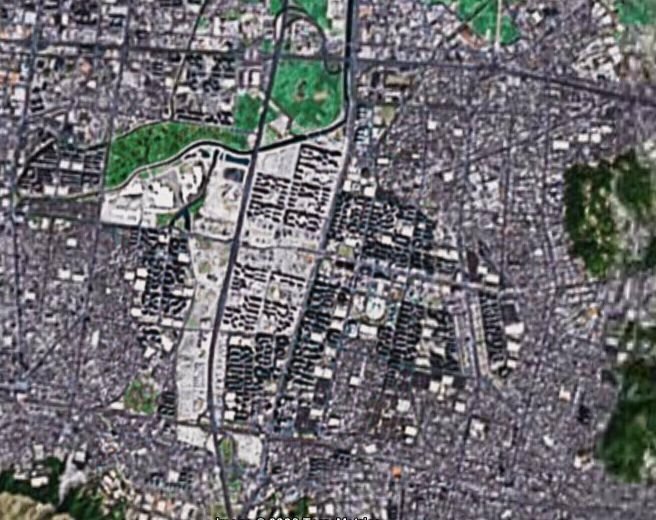 That same outline of Jung-dong can be seen below, not as the outline of a development, but as the edge of the city. 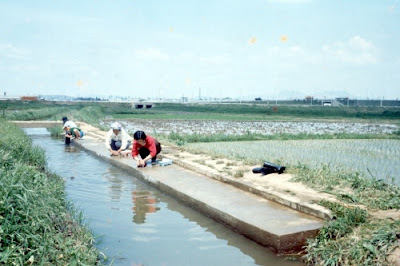 This photo was likely taken in the mid 1980s, when Bucheon would have been reaching as far north as the Gyeongin Expressway (in the1988 documentary "Sanggye-dong Olympics", the residents evicted from Sanggye-dong buy land next to the expressway in Bucheon, where only fields can be seen). 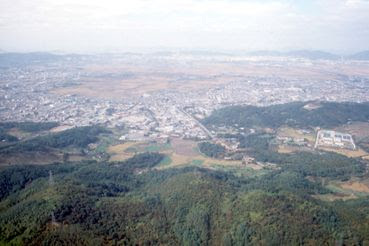 This photo is taken above Wonmisan, and looks west. The bare patch of land in the center of the photo is where the Bucheon stadium is today. Much of the built up area to the right in the picture above is made up of factories, which began to appear with increasing speed in the mid-to-late 1970s. 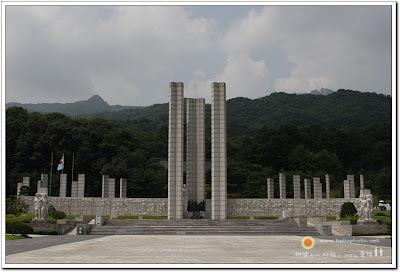 The industrialization of Bucheon reflected the modernization of Korea as a whole, of course. 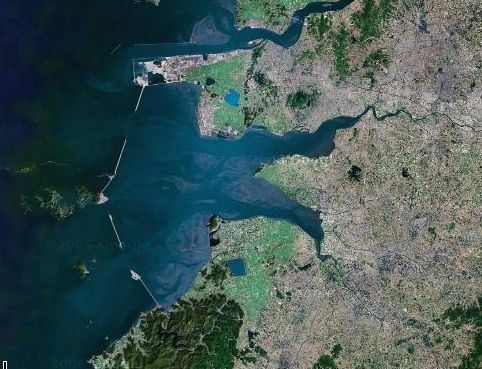 It's location, sandwiched between the port of Incheon and the capitol made it an ideal spot for such growth, and this is what sent urban Bucheon sprawling northwards (even now, much of the kilometer-wide strip running alongside the mountains is made up of factories). 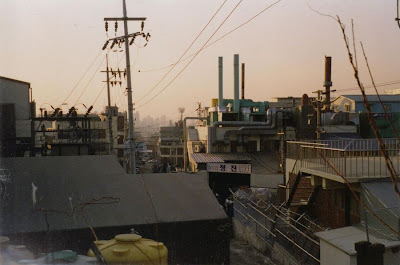 Above are photos I took in eastern Bucheon in 2002. 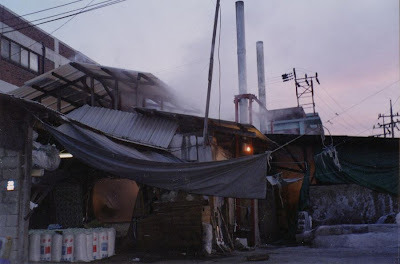 Most of the factories are small or middle-sized, and since the 1990s have been employing more and more migrant workers. 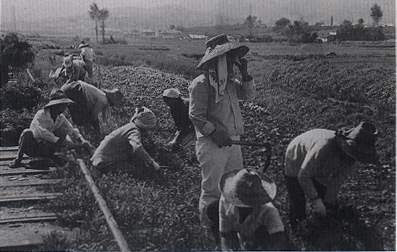 As Bucheon grew, it would begin to allow the buildings of apartments (the first complex appeared in 1982). Of course, it was Seoul's need to find new spaces to house its overflowing population that would see Bucheon change drastically into the city it is today. I'll leave that story for another day. 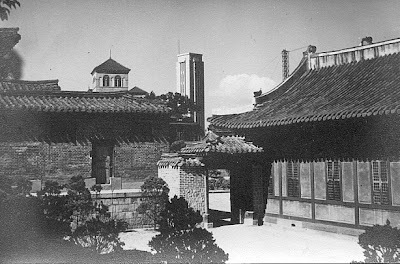 Awhile ago I wrote about Jeong-dong and the interaction between the growth of the foreign community there and the growth in importance of Deoksu Palace. After that I became interested in finding some of the still existing buildings but never got too far with it. 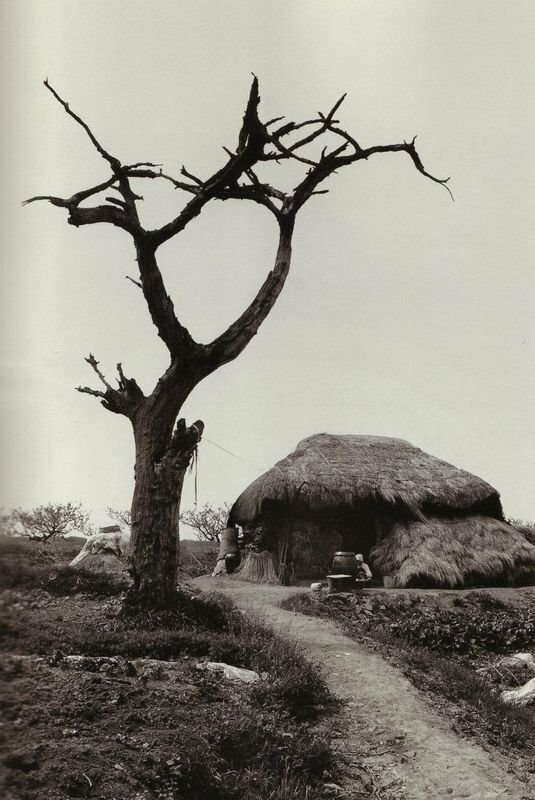 Happily, Robert over at the Marmot's Hole has a stellar set of photos of the surviving Chosun dynasty and colonial era buildings. While I never got around to taking many photos there, I have managed to dig up some old photos of the area, so I'll take this opportunity to post them now. Two photos of the First Methodist Church follow, with an obvious gap of a few years between them. The latter was apparently taken in 1903. 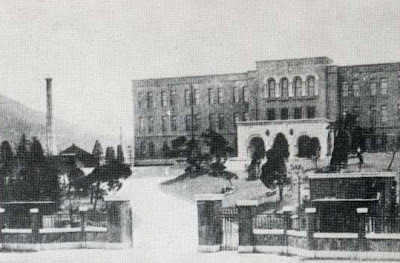 Two photos of Deoksu palace follow. The first is of Daehanmun, with building materials outside. 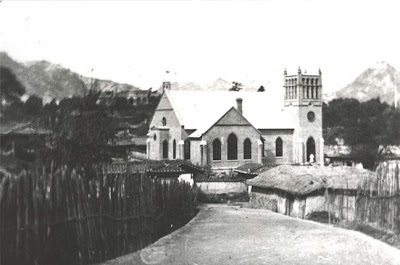 In the next photo, taken in the 1930s, the Anglican church and the Municipal Hall can be seen from inside the palace. I hadn't realized that this palace had been mostly unused prior to the 1890s (which is likely why parts of the palace were sold off to the Americans and British to use for their legations. 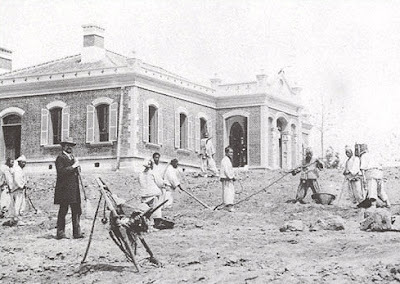 A great deal of reconstruction was needed to turn Deoksu palace into an appropriate place the King. 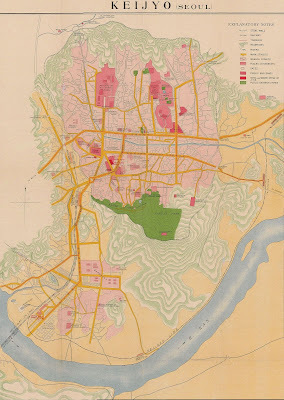 Some more information about this can be found here, in an essay titled The Nature of Seoul's Modern Urban Development During the 18th and 19th Centuries, by Yi Tae-jin (it's a little, I think, too favourable towards the King, but it's still an interesting enough read). Of course, there's also a much larger 1946 US military map here. A year after the completion of a sea wall reclamation project at Kimjae, North Jeolla Province, sea foam devoid of life washes up on the Geojeon tidal flats. A researcher said the levels of life in the surrounding sea dropped suddenly after the reclamation project, signaling an ecosystem that has been thrown out of balance. I wrote about the completion of the seawall last year. Below is a older satellite photo of the area. The map above suggests where the new farmland will be developed, as well as pointing out out the location of...a new tourist resort! The sea foam in the tidal flats may be devoid of life, but not to fear - apartment life will soon replace it! Are violent Korean films to blame? Apparently the film Oldboy is being blamed for Cho Seung-hui's killings, based on the fact he holds a hammer in one of the photos that was released today. This blogger thought Oldboy might be responsible before the photos were released, and while some may say that it might be hard to judge Oldboy having walked out after 10 minutes, he may well be on to something when he talks about "awfully violent" Korean movies and the effect they may have had. He later writes that "Not all South Korean films are quite so carnage-filled". If only this were true! Even many light-hearted movies, some set in schools, during the Chosun Dynasty, or even during the Korean War feature a great deal of casual violence, and though he refers to Kim Ki-duk's "Spring Summer Fall Winter and Spring" as not being violent, it should be noted that it is one of the least violent of his films, most of which are very disturbing. To show how disturbing even Korean comedies can be, perhaps "My Sassy Girl", the top comedy hit of 2001 in Korea, and the best-selling comedy in there until that point, will provide a rather shocking example. The film essentially consists of a woman berating, manipulating and repeatedly hitting the fool who loves her for the entire movie. And believe it or not, the words that come out of her mouth most often during this movie are "Wanna die?" But that's not the only reason this film is suspect and cause for concern. This "comedy", you see, turns much darker. In the last scene above, a boy is buried alive. I'm not joking. The people are hitting him with shovels so that they can keep him still long enough to bury him. And this is a romantic comedy. Let that sink in. Not only that, it was popular throughout Asia, and also among Asian-Americans. It's entirely likely that Cho saw this film, with its recurring death motifs, gunplay and suicide attempts. It may well have played a part in what led to what happened on Monday. And this is just one movie. 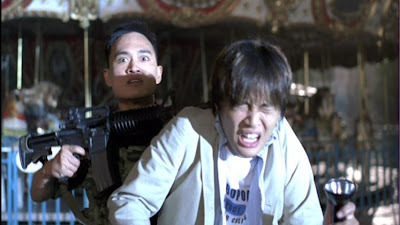 It should be kept in mind that there are many disturbing movies produced in Korea, such as the hit "Friend", which features stabbings, while hits "Silmido" and "Taegukki" feature a great deal of gunplay. 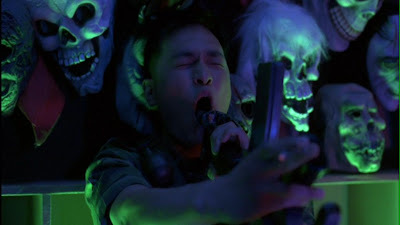 Other hits like "The Host" feature the use of molotov cocktails, guns, and bows and arrows, while in "The King and Clown", a man's eyes are burned out. Most chillingly, "A Tale of Two Sisters" chronicles a girl's descent into madness. Could it possibly have set Cho off? Could any of these movies? Could another person who has watched any one of them be a ticking time bomb? The threat of this occurring outside of Korea is very real. Rampant illegal downloading makes these films available to anyone with a computer. If someone you know brings up one of these movies in conversation, keeping an eye on them may save lives. I don't want to try to predict too much, but I'm sure that when studies are done, it will be concluded that by not watching Korean films, you will be at least 20% safer. As soon as the name of the shooter at Virginia Tech University was released last night, it was trouble for anyone named Cho Seung-hui, spelled two different ways in Korean. Internet users tracked down people with that name, leaving rude comments, curses and pleas on the guestbooks of their Web sites. If you were thinking that the comments read something along the lines of, "Murderer! You've brought shame upon our country! ", you'd be correct. I wanted to bring this article up today in class but found it difficult to refer to the netizens without using a lot of foul language, so I just decided to drop it. One my students responded, on hearing Cho Seung-hui's name, "It's so embarrassing." When asked why, she said, "He killed so many people. It's so embarrassing that he's Korean." It seemed within the Korean media that the most pressing result of Cho Seung-hui's actions was the veritable wave of hatred that would surely be brought down upon Koreans in the US. In this story, the title of which reads, "Kimchi is Poisonous" - Signs of hatred and anti-Korean sentiment among American Netizens," we're shown this entry at fark.com, where commenters say things like, "Are we going to bomb the holy hell out of South Korea now? ", and "I knew Bush put the wrong Korea in the damn Axis. "These statements are taken at face value in the article, but if you read the comments at fark, there's not much there that could be seen as venomous outbursts against Korea, of the sort one can find in many comments at, say Naver, directed at foreigners, especially Americans. In fact, I took the "bomb Korea" comment as a not-so-subtle reference to Bush's hastily planned war in Iraq, and the likelihood that Iran may be next - in other words, as a joke with a slight political subtext. But in Korea, where hitting yourself on the forehead repeatedly can pass as comedy, this kind of joke may seem a little foreign. I do wonder, though, if the person translating these statements was really so ignorant of their sarcastic nature. I'm hoping this is just a misunderstanding, and not a willful attempt by those in the media to stir up fear of a violent American response by searching for any signs of the hatred and violence against the 'outsiders' that would only too surely happen in Korea were a similar tragedy to occur at the hands of a foreigner. As for those idiot netizens, Cho was obviously a very sick, disturbed person. What's their excuse? The shooting in Virginia reminds me of the flooding of New Orleans, in that it serves as a chance, in the media and blogosphere, to vent grieviances and point blaming fingers at those you disagree with. Of course, what gets lost in this is the tragedy itself. It seems one of the main arguing points in the US is over gun control, but since the killer was revealed to be Korean, the war of words in the comment sections of Korea blogs has been of a different nature. Very quickly, it has become a debate over Korean identity in both Korea and the US, and has taken a critical look at Korean society's reaction to the fact of the shooter's Korean identity. To see the 300-comment fisticuffs between current and former foreign residents of Korea and Koreans living in the US (mostly), do head over to the Marmot's post on all of this (and the comments section...if you dare). The Metropolitician has produced two posts which have stirred up some emotions, looking at aspects of Korean culture that can create difficulties for Korean men studying or living overseas, and the reaction of the Korean society to this event. It was the reaction of Korean society (and the media in particular) that I was bracing myself for. Here's one of my 'favourites'. "In one bang, 33 people….This reconfirms the superiority of our gun technology." This was posted at the Seoul Shinmun shortly before it became known that the shooter was Korean. 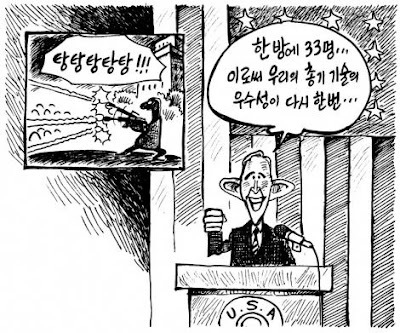 Of course, it makes sense, seeing as there were so many American newspapers printing cartoons after the Daegu subway fire in early 2003 which joked about the "superiority of Korean gasoline." Right? More foot in mouth cartoons can be seen over at Occidentalism. For those who have tired of the Korean media scapegoating foreigners, and "gusts of popular feeling" that follow negligible incidents involving foreigners (English Spectrum, the Swiss offside goal that wasn't, the tank accident in 2002, the speed skating incident, every altercation between a GI and taxi driver, and on and on and on), who are no fans of hypocrisy, and who (perhaps wisely) don't feel like wading through the Marmot's comment section, perhaps this comment is for you. 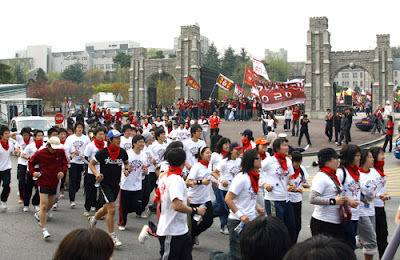 of the shooting rampage at Virginia Tech on Wednesday"
"Korea University students sprint out of their campus yesterday to mark the anniversary of the April 19 uprising in 1960. Korea University students triggered the uprising. " So seeing as the students were all outdoors in a large group, I guess it was a good time to pause for a few minutes and do their part to look concerned while the cameras snapped away so that Americans would go easier on their brethren in the US and Korea's image would look a bit better. The Korea Herald was happy to play along and not let anyone on to what the real purpose of the gathering was. Now, if they had planned to have a tribute to the victims before the Korean identity of the killer became known, then, whoops. Sorry. I hope that is the case, though hope and belief are two different things. The Democracy Run above reminds us that today is the anniversary of another shooting, one I was reminded of in an odd way while looking into the shooting in Virginia. 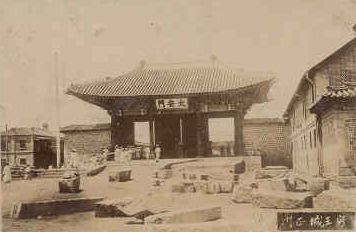 In this article, we're told that Cho Seung-hui lived in Chang-dong in Dobong-gu (up near Uijeongbu) prior to moving to the US. The media frenzy in front of the house where Cho grew up. Some photos of the cemetery can be found here. Today is the 47th anniversary of the April 19 "democratic revolution". Photos of the uprising can be found here; I also posted photos of the uprising last year and compared them to the Kwangju uprising. While hundreds of arguments are being waged by fingers tapping at keyboards over the shootings this week, this 47-year-old event caused a literal fist-fight at Seoul National University this past November. 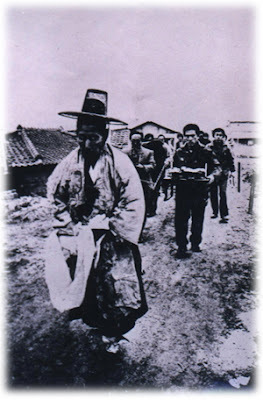 The fight was over how the 4.19 uprising and the 1961.5.16 coup by Park Chung-hee would be named. A conservative group writing a new textbook wanted to call 4.19 a student movement, and 5.16 a revolution; leftists disagreed, and a fight broke out. The story can be read here, here, here, and here. Hopefully people won't be fighting over the events of this week in 2054.